Fedena is an open source school/campus management system developed by people like you! It is a one stop solution for all school management related issues and helps you manage student databases and all other activities online. 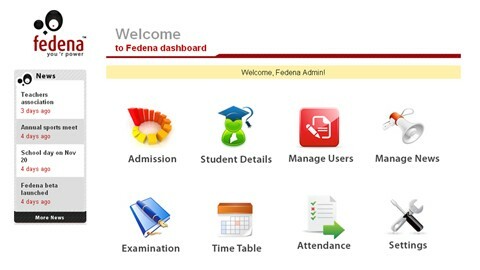 Fedena is the ideal solution for schools and universities that want an easy means to manage all campus records. If you are a school/campus administrator, contact them and they will set up a free account for your institution. Fedena is an open source software, which means that you don’t have to pay anything to use the basic system. This could be very useful. I have a friend currently using Drupal to acheive something like this. Anyone using it yet in a development environemnt?